It might be summer, but if you live up north you know one thing. Winter is coming. And while your leaves are changing and snow flurries are falling, Florida is busy being sunny and sensational. This retiree’s paradise is perfect, whether you’re looking for seasonal digs or permanent ones. We’re going to walk you through some reasons Florida is the place to be this winter. Because you can’t shovel sunshine, ya’ll! 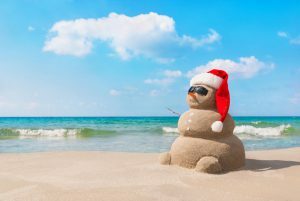 Techically, there is a winter in Florida, but we’re you’re spending Christmas at the beach it sure doesn’t feel that way. The average annual temperature is a comfortable 81 degrees, while the annual low is just 60. 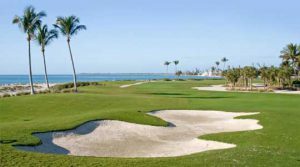 So you can be pretty sure most days will be perfect for the beach, enjoying drinks outside or playing a round of golf. While the summers may be hot (and you might not even be here), the rest of the months more than make up for it! No pictures of taxes, but here’s a golf course on the beach in Indian Shores, FL. Alright, no one really wants to talk about taxes, but here is the low-down you might want to know. Florida doesn’t have a state income tax, interitance tax or estate tax. That’s why even many of our seasonal residents choose to have their main real estate here in Florida. Time to save money, and have fun doing it! Siesta Key Beach in Sarasota, Florida. Love the ocean? We have some great news for you! No matter where you are in Florida, you’re never more than two hours from the beach. We have the Atlantic Ocean on one side, and the Gulf of Mexico on the other, plus loads of lakes and canals! Check out the east coast for some awesome waves and drive-up beach access. Or visit the west coast for beautiful sunsets and sugar sand in Siseta Key (voted America’s #1 beach in 2017). Whatever water floats your boat, Florida’s sure to have it. Forget retirement where you sit on the porch and drink sweet tea (okay, that actually does sound pretty nice). Today’s retirees are active and ready for adventure, and the sunshine state is ready to deliver. Florida has a wide range of amazing 55+ communities where you’ll find resort-style amenities, affordable housing, great friends, monthly events and more! These aren’t your mom’s retirement communities. Check out our website to learn more about some of our 55+ communities that you can call home this winter! Golf Course at Rolling Greens, a premier 55+ community in Ocala. Speaking of active adults, you’ll never get bored in Florida. From amusement parks and water sports, to golf and fishing, this state has it all. We’re home to over 1,300 golf courses too! Why stay inside and shovel snow when you could be outside enjoying life? Take a bike ride on the beach, or try America’s new favorite sport: Pickleball! Great ready to live the life of you dreams, right here in Florida! Want to find homes for sale or rent this winter in our Newby Management communities? Check here! We can’t wait to welcome you. Today’s buyers are looking for something different than ever before. They want homes that are stylish, affordable and most importantly, energy efficient. Green homes are not only good for the environment, they are good for your pocketbook too. Finding everything on your dream home wishlist might seem like an HGTV miracle, but manufactured homes are here to surprise and delight you. 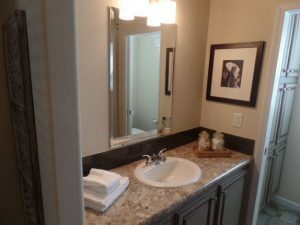 Many 2017 manufactured homes are built with modern, stylish interiors that include upgraded features like granite, stainless steel, laminate wood flooring and over-sized garden tubs. These chic homes aren’t just easy on the eye, they are energy efficient too! 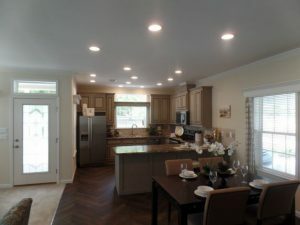 We’re going to take a look at Skyline Homes, a craftsman manufactured home builder that partners with Energy Star to bring you the greenest homes available today. According to the National Association of Home Builder’s latest survey of home buyer preferences, Energy Star appliances and windows, along with an overall Energy Star rating, were among the top-5 most wanted features. Other wanted features include a programmable thermostat, which is available as an upgrade in Skyline homes. Over the course of a year, a single family can expect to pay about $2,060 in energy bills, according to Energy Star. Green homes can cut that bill by upwards of $300 a year or more. If saving money isn’t enough, these homes are also more comfortable too. Certified Energy Star homes keep out excessive heat, cold, and noise, and ensure a consistent temperature between and across rooms. Other manufactured home builders, like Clayton Homes, are also Energy Star certified. Like Skyline, they meet or exceed government standards for green homes. Both companies also use green building practices during construction, which means they produce less waste on average than comparable site-built homes. At Newby Management, we are proud to bring you the latest and most energy-efficient manufactured homes on the market. 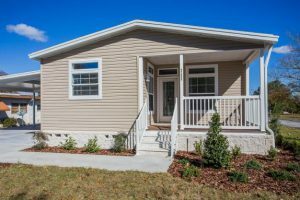 Many of our communities now feature new 2017 manufactured homes for sale. 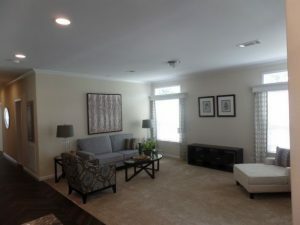 The home showcased in this blog is located at Rolling Greens, a premier 55+ golf course community located in Ocala, Florida. This home is energy efficient, and beautiful too. Home buyers will love the chef’s kitchen, complete with granite counters, stainless steel appliances and gorgeous laminate flooring. The cathedral ceilings open up the home and let in Florida’s beautiful sunlight. With an open floor plan, you’re ready to entertain friendly neighbors whenever you please. Plus, it features a large screened-in porch where you can enjoy the sunshine state’s fabulous year-round weather. And during those warm summer months, you don’t have to worry about keeping your home nice and cool. We have new construction manufactured like this and many more available in Newby Management communities across the state. We can also help you choose a home and floor plan that works best for you. Whatever new construction home you choose, you can be rest-assured knowing it will meet the highest energy efficiency building standards to date. Let us help you go green! Watch out, tennis because there’s a new sport in town. A combination of tennis, badminton and table tennis, pickleball is one of the fastest growing sports in America. It’s a great way to get active for young and old alike. The sport is played on a badminton-sized court with a modified tennis net. Players use a plastic ball with holes in it and they serve across the net, much like in tennis. The rules are simple and easy to learn, but it can develop into a fast-paced game for more experienced players. In fact, it’s becoming so popular one business was able to go from an online store to a retail store in just three years. Pickle Pro started off selling pickleball paddles online, and was able to open up a store four years ago in Naples Florida. The owner says the company grows about 150% per year. 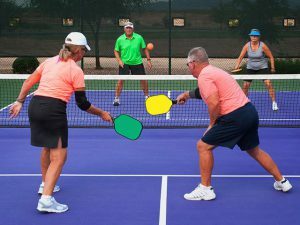 For two years, more than 1,300 athletes compete in the U.S. Open, a seven-day national pickleball tournament held at East Naples Commuity Park. That’s a 40% increase in participants from the first tournament held in 2016. Although the sport is growing in popularity across the nation, Florida is becoming a hub for pickle-ball lovers everywhere. The U.S. Open is helping Naples become the ‘Pickleball Capital of the World’. While in town, local stores sell everything from paddles and balls to special shoes designed with pickleball in mind. Players say the sport is addicting, and it’s being touted as the number one way for active adults to stay in shape. It’s great cardio, while being easy on joints. This combination is causing 55+ communities to start adding pickleball courts to their list of amenities. At Newby Management, we are no exception. In fact, many of our communities now have dedicated pickleball courts, along with hosted games and even tournaments. With Florida’s year-round beautiful weather, there’s never a bad time to get outside and see why pickleball is America’s new favorite sport. The smell of barbecue chicken wafts through the summer air. It’s a smell that creates memories and brings them back for residents at Newby Management communities. 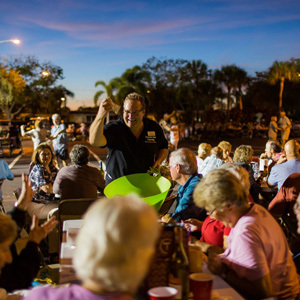 For the residents, it’s about more than a BBQ, it’s a time to connect with friends, to relax and to enjoy their community. serve up grilled chicken, potato salad, beans, dinner roll and a large cake. 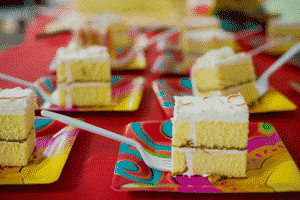 Themes create a fun and exciting atmosphere, different years have featured fiestas, the 70s and more! As you can imagine, a lot of logistics go into a BBQ for an entire community! 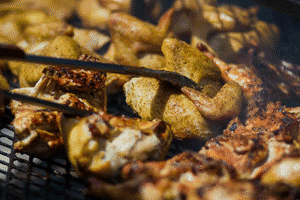 In some larger communities, our team may cook over 400 pieces of chicken. This means we start at dawn and turn the grill four times! You definitely won’t go away hungry from one of our shindigs either. We give very specific instructions to local butchers on how to quarter the chicken so each serving is huge. That’s right! We not only serve big pieces of chicken, but we also use local butchers near the community we’re serving. When a resident comes through our line, they can be assured that we temp tested the chicken before it leaves the grill, so we can be sure it’s cooked thoroughly. Then comes the fun part: deciding whether you want light or dark meat. Delicious! You can get a piece plain or drenched in Sweet Baby Ray’s BBQ Sauce. We love summertime because it means an opportunity to serve our residents and give back to our communities with a good old-fashioned southern BBQ. To our team, these are times of great fellowship and fun. They are a time to create new memories and reflect on past memories. They are a time to remind our residents that we are on their side. And of course, we can’t forget the delicious food! Do you want to learn more about Newby Management? Visit us online at www.NewbyManagement.com.